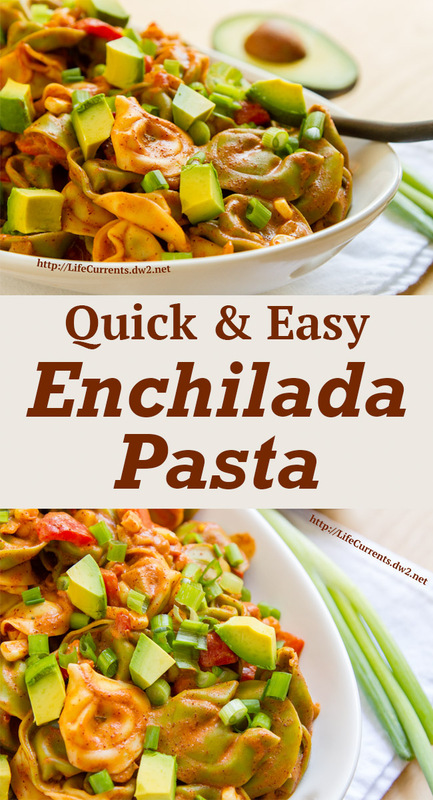 I created this Enchilada Pasta because I didn’t really feel like cooking one night. So I went to some of my staples. I try to keep a large bag of tortellini in the freezer. So I thought I’d just make something with that. Maybe just top it with marinara. Wait, I had a jar of Easy Enchilada Sauce in the fridge. Well, to be honest, I almost always have some in the fridge. But, if you don’t have any already made, it only takes about 15 minutes to make. Check out the recipe here. Then I thought I’d make it a little creamy by adding some sour cream. And, I tossed in whatever veggies were around. And you know what, it was excellent! So, I had to recreate it for you! It makes a great quick dinner, or if you’re planning ahead for lunches, it’s perfect for the desk jockey’s lunch. One bowl. Easy to eat. Delicious! If making this ahead for tomorrow’s lunches, add a little extra enchilada sauce, because as the pasta sits it’ll absorb some of the moisture. So, I’d add about ¼ cup of enchilada sauce and maybe a tablespoon of sour cream. No need to defrost the corn, the heat from the boiling water will heat it through. Just place the frozen corn at the bottom of your strainer (make sure the holes aren’t so big that the corn will just slide thorough). Then, once the pasta is done cooking, pour the boiling water over the corn and through the strainer. Voila! I do this method for frozen peas too when I’m making something like tuna noodle casserole. I used a pesto cheese tortellini with white and green pasta, but use whatever cheese tortellini looks good from your store. The longest part of this recipe is waiting for the water to boil. Other than that, dinner’s ready in no time! And, it’s a dinner your family will love and ask for again and again. In a large pot over medium heat, bring 6 quarts water to a boil. Once the water boils, add the tortellini, cooking according to package directions, usually about 3 minutes. While you’re waiting for the water to boil, chop the red peppers, and place the frozen corn in bottom of the strainer. Once the tortellini is cooked through, pour the boiling water over the corn through the strainer, and strain the cooked pasta. Place the drained pasta and corn back in the same large pot, and toss in the red pepper and green chiles. Gently mix in the enchilada sauce and the sour cream. Serve, garnishing with chopped green onion and diced avocado. This looks so good! Perfect summer food! This is a great way to clean out your fridge and pantry and you came up with a great meal, looks so good. What a healthy and delicious pasta with a bit of ole Debi! Pinned and shared! A beautiful and colorful pasta dish! Looks very yummy too! This looks wonderful, Debi! I love all the wholesome ingredients and it sounds just scrumptious. First of all I love Mexican and second I love easy weekdays meals! So this is right up my alley! Boy this caught my eye! Thanks again for sharing your recipe at Try a Bite Tuesdays – I’ll be featuring it this week….gotta love an easy weeknight meal, YUM! I have never tried anything like these before. I have tried Enchiladas and Pastas but never Enchilada pasta. I will have to start keeping tortellinis in the freezer. The avocado is a very nice touch.